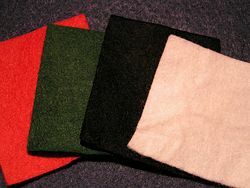 A selection of four different felt cloths. Felt is a non-woven cloth that is produced by matting, condensing, and pressing fibers together. It is the oldest form of fabric known to humankind, predating weaving and knitting. It can be of any color and made into any shape or size. Felt is widely used as a medium for expression in textile art as well as design, where it has significance as an ecological textile. It is also found in various musical instruments, craft kits, and displays used for story-telling for children. The automotive industry uses felt to dampen vibrations between the interior panels of automobiles and to prevent dirt from entering some ball/cup joints. It may also be used as a sealant in machines. Many cultures have legends regarding the origins of felt making. For example, Sumerian legend claims that the secret of felt making was discovered by Urnamman of Lagash. According to one European legend, the invention of felt is attributed to Saint James the apostle, who inserted tufts of wool in his sandals to soothe his feet during his evangelical travels. After some time, the wool became compacted by the pressure and sweat, and that is thought to mark the origin of felt. Another legend maintains that it was Saint Clement (not Saint James), a monk who became the fourth bishop of Rome, who placed tow (short flax or linen fibers) in his sandals and discovered that the fibers became matted together to produce felt. In Turkey, the remains of felt have been found dating back at least to 6,500 B.C.E. Highly sophisticated felted artifacts were found preserved in permafrost in a tomb in Siberia and dated to 600 C.E. Felt-making is still practiced by nomadic peoples in Central Asia, where rugs, tents and clothing are regularly made. 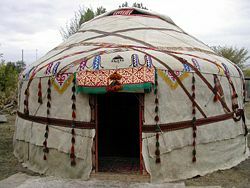 Some of these are traditional items, such as the classic yurt, while others are designed for the tourist market, such as decorated slippers. Felt is made by a process called wet felting, where the natural wool fiber is stimulated by friction and lubricated by moisture (usually soapy water), and the fibers move at a 90 degree angle towards the friction source and then away again, in effect making little "tacking" stitches. Only five percent of the fibers are active at any one moment, but the process is continual, and so different 'sets' of fibers become activated and deactivated in the continual process. From the mid-seventeenth to the mid-twentieth centuries, a process called "carroting" was used in the manufacture of good quality felt for making men's hats. Rabbit or hare skins were treated with a dilute solution of the mercury compound mercuric nitrate. The skins were dried in an oven when the thin fur at the sides went orange—carrot color. Pelts were stretched over a bar in a cutting machine and the skin sliced off in thin shreds, the fleece coming away entirely. The fur was blown onto a cone-shaped colander, treated with hot water to consolidate it; the cone was peeled off and passed through wet rollers to cause the fur to felt. These 'hoods' were then dyed and blocked to make hats. The toxic solution and the vapors it produced resulted in widespread cases of mercury poisoning among hatters. (Some suggest that this may have been the origin behind the phrase "mad as a hatter" and the name of the character of the the Mad Hatter in Alice in Wonderland. However, others argue that the Mad Hatter's character was more likely based on someone who was not a hatter and did not exhibit signs of mercury poisoning.) The United States Public Health Service banned the use of mercury in the felt industry in December 1941. Knitted woolen garments that shrink in a hot machine wash may be said to have "felted," but more accurately, they have been "fulled." Felting differs from fulling in the sense that fulling is done to fabric whereas felting is done to fibers that are not in fabric form. Modern fulling is an example of how the fibers bond together when combined with the movement of the washing machine, the heat of the water, and the addition of soap. Cheaper felt is usually artificial. Artificial felt, if made using the wet method, has a minimum of 30 percent of wool fibers combined with other artificial fibers. This is the minimum required to hold a fabric together with the fibers alone. It would be difficult to achieve a stable fabric by hand at this ratio. All other wholly artificial felts are actually needle-felts. Felt is useful for many applications, ranging from the automotive industry to musical instruments to children's story-telling. It is often used as a dampener. In the automotive industry, for example, it dampens the vibrations between interior panels and also stops dirt entering into some ball/cup joints. A felt-covered board may be used in telling stories to small children. Small felt objects (shaped as animals or people) will adhere to a felt board, and in the process of telling the story, the storyteller also acts it out on the board with the animals or people. Puppets can also be made with felt. While a woven (not felted) fabric is less expensive and more commonly used, felt is used on professional or tournament billiards table to cover the slate surface. German artist Josef Beuys used felt in a number of works. Many musical instruments use felt. On drum cymbal stands, it protects the cymbal from cracking and ensures a clean sound. It is used to wrap bass drum and timpani mallets. Piano hammers are made of wool felt around a wooden core. The density and springiness of the felt is a major part of what creates a piano's tone. As the felt becomes grooved and "packed" with use and age, the tone suffers. Though the ukulele is most commonly plucked, the pick, or plectrum, is made of felt. Needle felting is a popular fiber arts craft conducted without the use of water. Special barbed felting needles are used by the artist to sculpt the wool fiber. The barbs catch the scales on the fiber and push them through the layers of wool, tangling them and binding them together much like the wet felting process. Fine details can be achieved using this technique and it is popular for 3D felted work. Additional objects that involve the use of felt include air fresheners, holiday decorations, and sealants in machines. ↑ The term felt used in this article should be distinguished from roofing felt, which is a common type of tar paper used for roof construction. ↑ History or Legend Fabulous Hats: History of Hats. (A legend of felt invention.) Retrieved September 22, 2008. ↑ H.A. Waldron (1983), Did the Mad Hatter have mercury poisoning? Br. Med. J. (Clin. Res. Ed.) 287(6409): 1961. Retrieved September 22, 2008. This page was last modified on 5 April 2017, at 16:12.